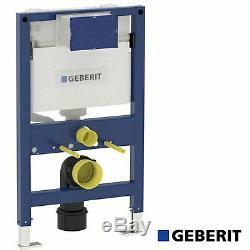 Geberit Kappa Duofix Wall Hung WC Toilet. Frame UP200 Cistern 820 111.260.00.1. This frame is designed to be used with back to wall / wall hung toilet pan. It is supplied with a concealed cistern but does not include the wall flush plate (available separately). Why choose a wall hung toilet? Makes cleaning very easy Gives a more open and uncluttered feel to the bathroom Why choose this wall hung frame? Powder coated steel frame that is self-supporting Supports wall hung toilets with hole centers of 180 mm or 230 mm Zinc plated non-slip leg supports, adjustable 0-20 cm Suitable for solid and drywall constructions What about the concealed cistern? Fully insulated against condensation that also helps reduce noise 3 modes of operation: single flush OR dual flush OR stop-and-go flush Flush volume: 5.8 and 3 litres (factory setting), adjustable to 4.5 and 3 litres Water supply connection is located on the left Flush plate NOT included (available separately) - Dual flush compatible with Kappa flush plates Overall dimensions: Width 500 mm x Height 1120 mm Please refer to the technical diagram for exact and adjustable dimensions. 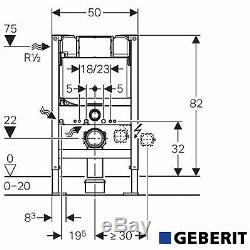 Technical data Flow pressure: 0.1 - 10 bar Maximum operating temperature, water: 25°C Flush valve features settings to enable either a 6l and 3l flush or a 4.5l and 3l eco flush. Orders paid before 1pm Monday to Friday (excluding UK Public Holidays) will be dispatched same day. We regret that we are unable to dispatch orders at weekends or on UK Public Holidays. Deliveries are only made Monday to Friday. We cannot be held responsible for items not being delivered on time as sometime things beyond our control can mean delays. On larger goods such as baths, bathroom suites etc the courier driver may require someone to help. Q - Can I combine more than one item under the same carriage charge? This will mean you only pay one carriage charge. If you pay for each item individually then you will pay carriage for each item. Q - Can I collect? A - Yes We do have collection facilities. We strive to offer products that will delight our customers, however there may be times when a return is required. All items must reach us in original condition, complete with all parts, instructions, accessories, covers, etc and with any seals, shrink wrap, packaging and labels intact. If goods have already been dispatched you are responsible for returning the goods to us at your own cost. We care about our valued customers, and will always try to help you. Please give us the opportunity to resolve any problem. We understand the concerns and frustrations you might have, and will try our best to resolve the issues. We will help you to resolve the problem. (Registered in England and Wales) VAT Reg No: 240160066. 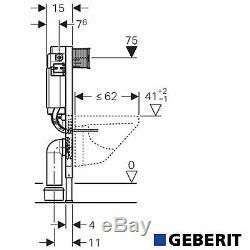 The item "Geberit Kappa Duofix Wall Hung WC Toilet Frame UP200 Cistern 820 111.260.00.1" is in sale since Monday, April 3, 2017. This item is in the category "Home, Furniture & DIY\Bath\Toilets & Bidets\Toilets". The seller is "empressbathroomsshop" and is located in 135-139 Long Lane Finchley Central London N3. This item can be shipped to United Kingdom.